There are some benefits to being somewhat long in the tooth. The benefits include being able to straddle both old world practices and new world technology and, if I may be so bold, the wisdom to know which shiny new thing deserves our attention i.e. the wisdom to see the difference between a fleeting fancy and something that just makes sense and will clearly be alive and well for a very long time. Like nature, biomimicry, and biophilic design. A “deconstructed” moss wall at Rosin Preservation: a series of 5 consecutive moss frames. We’re no Chip and Joanna Gaines but we have 20+ years of marriage under our belts and we married having known each other for just a couple weeks. Perhaps it is because our founder is Danish, but The Fat Plant Society has always had a very pragmatic view of design. Of course, like everyone, we love beautiful pieces but we also want them to be functional and low maintenance. But just because we ascribe to the genius that is Danish design, we do not relegate ourselves to a contemporary, modernist aesthetic. Essentially, our design principles are informed by two schools of thought: biomimicry and Danish design. Every designer and maker we talked to mentioned design principles. That was not a surprise but it was a nice commonality. We rather liked Mary Stribley’s article for Canva on the subject (obviously geared toward graphic design) and also rather liked Jennifer Cedarstam’s take on the topic but there is a plethora of information (and opinions) on design principles and which are the most important. Many designers talked about the need for breaking down silos and mentioned that they had worked to understand many other aspects of project work from building basics and product manufacturing so they could do their part to tear down the walls of their silo. We really respect that. Learn from and commune with other designers and fellow makers was another point that was mentioned more than once. The most important takeaway, however, was my favorite because it is a core value of our business and that was, be a good listener, because listening closely and carefully and asking probing questions is so valuable to understanding what a client wants in their design. That makes great, pragmatic sense, doesn’t it? And we are connected with other Kansas City Makers through the wonderful people at Flying Pig Local. What Katie Wooldridge and her team have created at Flying Pig Local in the Kansas City Crossroads is truly akin to what Ms. Carpenter has created with Maker + Place in Aspen but with a distinctly Kansas City feel and style and well, we love that. Beautiful and fun but unpretentious and friendly, just like this city we love. We are honored to be a part of that collective and learn from fellow artists and makers and stay connected to the KC Crossroads and all that it offers. So with regard to The Fat Plant Society and our very own design principles, they are actually very simple but very broad. Listen to the client carefully so as to be able to realize their vision. Ensure clients and prospective clients are aware that moss softens any space both visually and acoustically (and absorbs air pollutants). Share that moss is not relegated to contemporary design and can be tailored to any design style from rustic to craftsman and everything in between. Moss enhanced with elements of an antique steamer trunk. 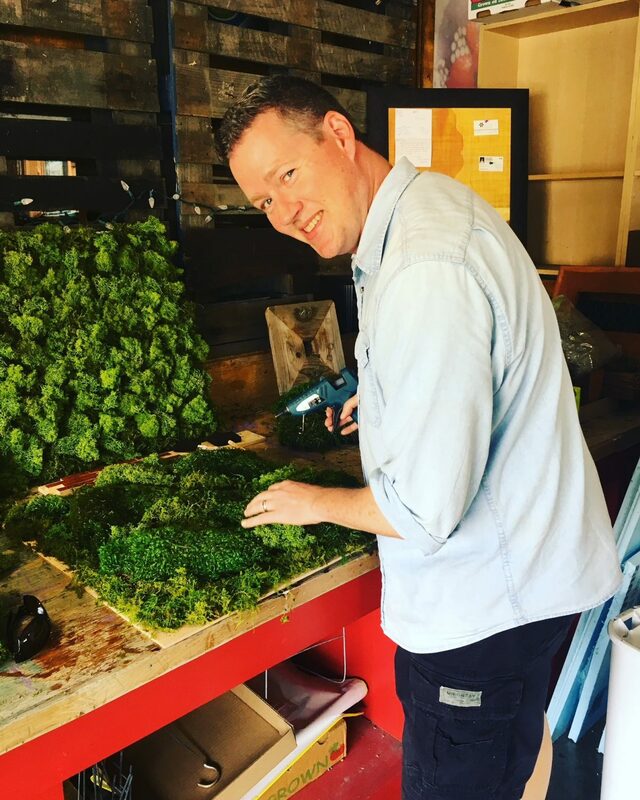 Educate clients and prospective clients in the variety of moss styles and colors–from sheet moss to reindeer moss to our newly acquired Basil Moss (a deep, dark green in color that pops like mad when paired with a white frame) and that moss is a natural product, harvested in North Carolina and Kentucky. That the incorporation of other elements such as antique carved wood or wood inlay or even wallpaper and the current vogue (but utterly timeless and always beautiful) chinoiserie panel can take the design to new heights. Current inspirations for higher-end moss designs include Viking inspired carved wood. Lastly, but certainly not least, lighting plays a very significant role in the appearance of the moss and can do wonders and can actually change the color of the moss (cue dimmer switch). So Happy Design Week to one and all in Kansas City. This is our design story and we are sticking to it. We are in this for the long haul and our aim is to develop products that respect as well as reflect nature but that does not place a significant maintenance burden on our clients or the environment as a whole. We will continue to utilize biopilic design and biomimicry as guiding principles for everything we create. Maybe one day, like Jamie Miller, we will have the opportunity to learn from Janine Benyus personally but until then, we’ll keep learning from everyone and every glorious bit of nature we encounter. We welcome your questions, your feedback, and of course, your design ideas.